Kamala Harris; Henry Winkler; Conleth Hill; Aaron Comess sits in with the 8G Band. John Jonchuck was found guilty of first-degree murder for dropping his 5-year-old daughter off a bridge four years ago. 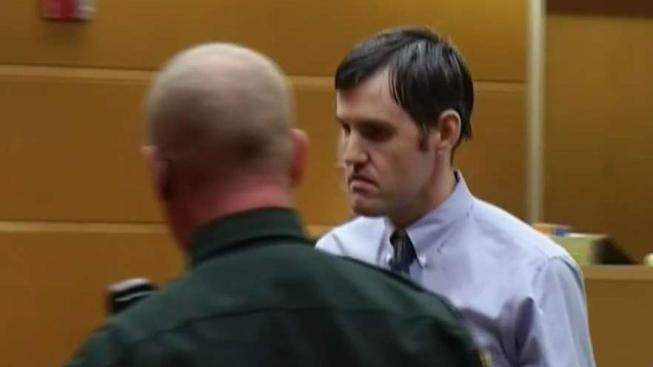 A Florida jury on Tuesday found a man guilty of first-degree murder for dropping his 5-year-old daughter off a bridge four years ago. Jurors in Clearwater, Florida, deliberated for about seven hours over two days before convicting John Jonchuck. Jonchuck hugged his attorneys and said, "Yes, your honor," when asked if he understood that the verdict carries an automatic life sentence. He was then fingerprinted and taken out of the courtoom by bailiffs. No one disputed that Jonchuck, now 29, dropped his daughter Phoebe 62 feet into Tampa Bay in January 2015, and that he had a long history of mental problems. But prosecutors claimed his action was premeditated. Assistant state attorney Paul Bolan told jurors that Jonchuck was motivated by anger over worries that Phoebe's mother was going to take the girl away from him and his own mother's doting attention to her granddaughter when she had been inattentive to him growing up. "It was rage that drove him to it on top of that bridge," Bolan said. "Did he know what he was doing, and did he know it was wrong? The answer is clearly yes." But assistant public defender Jessica Manuele told jurors Jonchuck loved Phoebe more than anything else in the world and that there's no evidence he acted out of "unbridled anger." His delusions led him to believe Phoebe was possessed and that the archangel, Michael, was coming, Manuele said. He poured salt outside her window to keep spirits away, she said. At the moment he threw her off the bridge, "he thought he was protecting his daughter," Manuele said. "It will never make sense because it's insanity." Twelve hours before Phoebe's death, Jonchuck's divorce lawyer, Genevieve Torres, called a state child protection hotline, fearing for the girl's safety, authorities said. Torres told the Department of Children and Families operator that Jonchuck had driven to three churches in his pajamas with Phoebe in tow that morning, called Torres "God" and asked her to translate his stepmother's century-old Swedish Bible, which he carried and had become obsessed with. Jonchuck was also paranoid that Phoebe wasn't his child, Torres said. But the operator thought the attorney was more worried about Jonchuck's safety than the girl's and did not report the call to authorities, they said. Just after midnight the next day, Jonchuck's PT Cruiser raced past officer William Vickers, who was heading home from a shift in his patrol car. He started following Jonchuck, but never got close enough to read the license plate and didn't know Phoebe was inside, authorities have said. As they reached the bridge's crest, Jonchuck stopped and got out. Vickers, fearing an ambush, stopped behind him, pulled his gun and yelled at Jonchuck to show his hands. He saw no weapon. Jonchuck yelled at the officer, "You have no free will." He grabbed Phoebe from the back seat, held her over the side momentarily and then dropped her, according to police accounts. Jonchuck drove off but was soon arrested. Vickers scrambled down a ladder to a dock below the bridge but couldn't see Phoebe in the dark water. A marine rescue boat was summoned, and her body was found hours later.